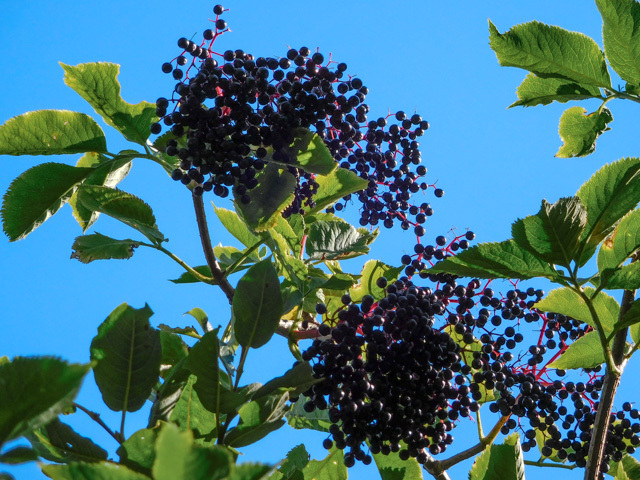 We have a large elderberry bush in the garden, and we’ve been watching it closely for the past couple of weeks. The berries have been formed for a while now, and it’s a fine balance between them being ripe enough to pick, and birds stripping the bush. Yesterday we decided it was time to harvest. We got a good haul from the lower branches, but we did leave plenty higher up for the birds. Our plan was to make elderberry cordial, but in the event we got enough to make some jam too. Those have gone into the freezer for another day. We follow a recipe from James Wong’s book Grow Your Own Drugs. He recommends taking a spoonful to ward off winter coughs and colds, but we prefer to dilute it it with hot water and drink it by the mugful. 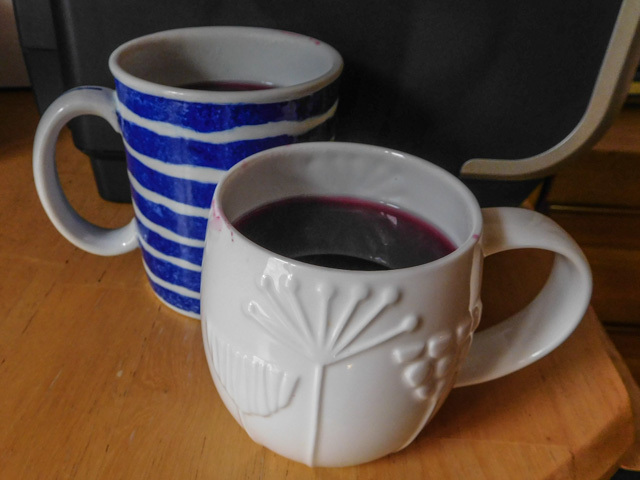 It’s a bit like hot Ribena, but with that distinctive elderberry taste. Very comforting in the depths of winter. It’s easy to make, as long as you have a big pan and something to strain the pulp. The worst bit is picking the individual berries from the florets. Then it’s just a case of simmering with water, straining, and boiling the liquid with some sugar and lemon juice. We ended up with just over 1.5 litres of cordial, which we put into plastic bottles. James Wong says that it will keep for up to six months in the fridge. We freeze ours and defrost it as we need it. But, of course, before we did that, we had to carry out some quality control. It’s a firm winter favourite, and packed full of vitamins. We usually make elderflower cordial too, but we venture further afield to gather the flowers, leaving the berries to develop on our own bush.